As Washingtonians celebrate the first anniversary of recreational marijuana stores opening across the state — some of us more than others — we wanted to look at this thriving new part of the state economy from as many angles as possible. In these pages, you'll find the result of that effort — a series of articles exploring everything weed related in Washington. We take you to 16 retail outlets in the area and see how they look a year in. You'll find guides to the products filling those store's shelves, including Spokane's most-popular strains, and a look at the myriad ways people partake in their marijuana of choice. We talk to a grower still waiting for the marijuana "gold rush" to pay off, and we explore how legalization has affected the efforts of anti-drug forces, pro-pot advocates and law enforcement in Washington and Idaho. We check in with Mike Boyer, Spokane's first recreational pot customer, who made national headlines last July. We're also sharing the results of our non-scientific survey designed to glean what our readers think about legal recreational marijuana. Admittedly, our respondents were self-selecting, predominantly pot-friendly readers. 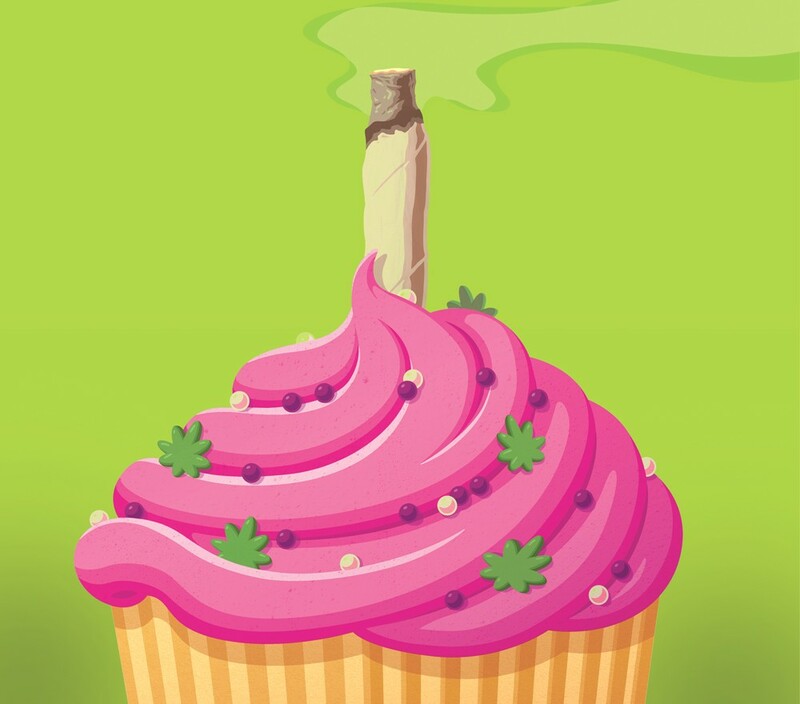 How pot-friendly? A full 92 percent of nearly 400 respondents said they've used marijuana at some point in their lives. What else can we broadly say about our respondents? Seventy-four percent are between the ages of 21 and 55, and most of them live on the South Hill, in North Spokane and Spokane Valley; 58 percent came from those three areas, with others scattered through West Central (4 percent), Idaho (4 percent), Browne's Addition (2 percent), Logan (4 percent), Hillyard (3 percent) and "Other" (23 percent). 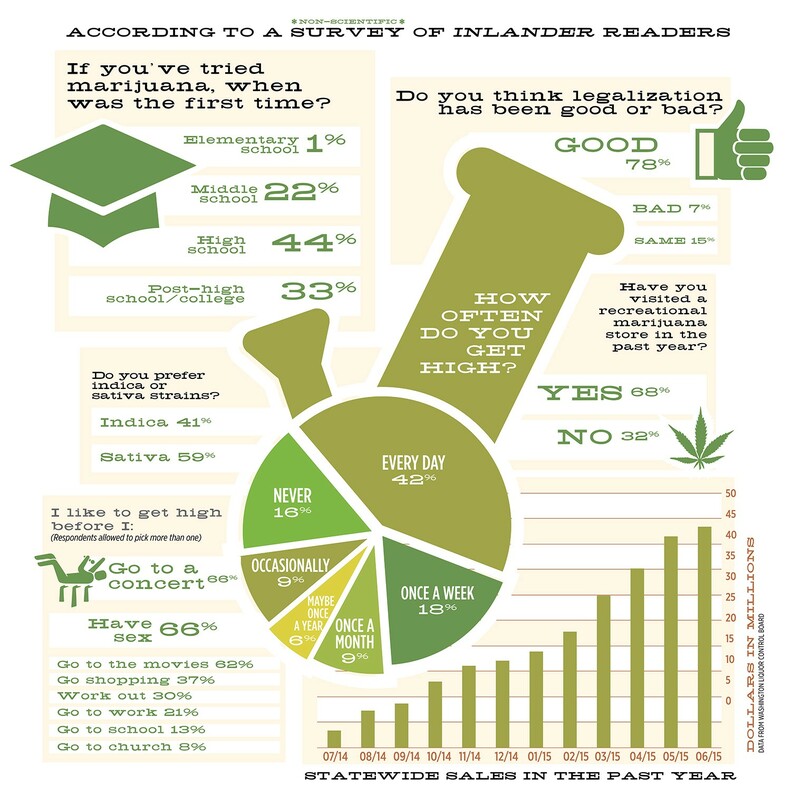 The responses we received help illustrate how and why Inlander readers use marijuana, and what they think about its effects on their state. We rounded percentages to the nearest whole number. Between our stories and the survey, hopefully you'll learn something about the state of this nascent industry just starting to get its balance. At the very least, you might learn the difference between "dabbing" and "vaping." I-502, the initiative to legalize recreational marijuana, is filed with state officials. New Approach Washington, a group backing the initiative, announces its goal to collect 300,000 signatures for the initiative. Eventually, 341,000 signatures are gathered. Washington's Secretary of State affirms that New Approach Washington has the 241,153 signatures needed to qualify for the November ballot. The Inlander publishes an editorial in support of I-502. Washington voters approve I-502 with 55 percent of the vote statewide; it passes in Spokane County with 52 percent. Cannabis is officially legalized, and possession of an ounce of marijuana is legalized for adults 21 and over. The Kettle Falls Five, a family of Eastern Washington medical marijuana patients, are arrested and charged with violating federal drug laws. The first draft of rules for marijuana growers, processors and sellers is released by the Washington State Liquor Control Board. The Spokane City Council passes ordinance outlining marijuana zoning that keeps recreational and medical marijuana businesses out of some mixed-use areas, pushing them toward industrial zones. The first license to grow and process marijuana in the state is awarded to Spokane grower Sean Green. Recreational marijuana stores open their doors. The highly taxed merchandise costs as much as $25 a gram, raising concerns that the new system won't be able to compete with the black market. Some stores face shortages. Defendants in the Kettle Falls Five trial are found guilty of illegally manufacturing more than 100 plants. They are acquitted of the other charges. Gov. Jay Inslee signs SB 5052 into law, bringing more scrutiny to the largely unregulated medical marijuana market by merging it with the highly regulated recreational market. Advocates worry patients won't have access to medicine. The state Supreme Court declines to hear a lawsuit challenging the city of Fife's ban on marijuana businesses. The court refers the case to an appeals court, which will hear arguments later this year. Inslee signs a law moving the recreational-pot industry from a three-tier tax system to a single 37 percent excise tax, a move that protects pot businesses from federal income tax. The law also loosens where stores and growers can locate and allows state to share pot revenue with local governments.